Barnes manufacturing was recently contacted by The Cedar Rapids/Linn County Solid Waste Agency’s landfill to help with a project. 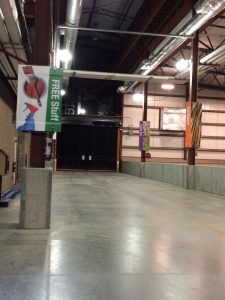 The Resource Recovery Center wanted to come up with a way to place banners along each recycling station to insure proper placement of each recyclable item. At Barnes manufacturing we appreciate and understand the importance of proper recycling habits, which made us very eager to help solve the landfill’s problem. 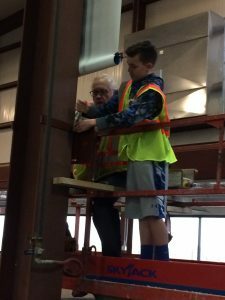 The team came up with a simple yet effective bracket system that would allow the beautiful new banners to hang from the vertical beams in the facility. Having obviously marked areas of separation is very important in the recycling center, so having these clear and concise signs will insure proper recycling. Once the brackets and banners were ready for installation, it was time for the trip to the landfill. So Tom and his grandson Harrison loaded up the truck and headed out. After taking a tour of the facility and learning about the importance of recycling, it was time to get to work. 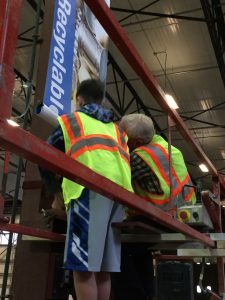 Tom and Harry went to each station one by one and installed each banner by hand. As a small family owned business we are fortunate for special opportunities to work with people who are important to us making this project that much more special. We would like to thank The Cedar Rapids/Linn County Solid Waste Agency for allowing us to help with your projects from time to time and the important work you do on a daily basis.